Posted on July 7, 2014 by University Sin Fronteras wrote in New Course Registration / Announcement, Recent News, SA, San Antonio, San Antonio Recent News and Events. 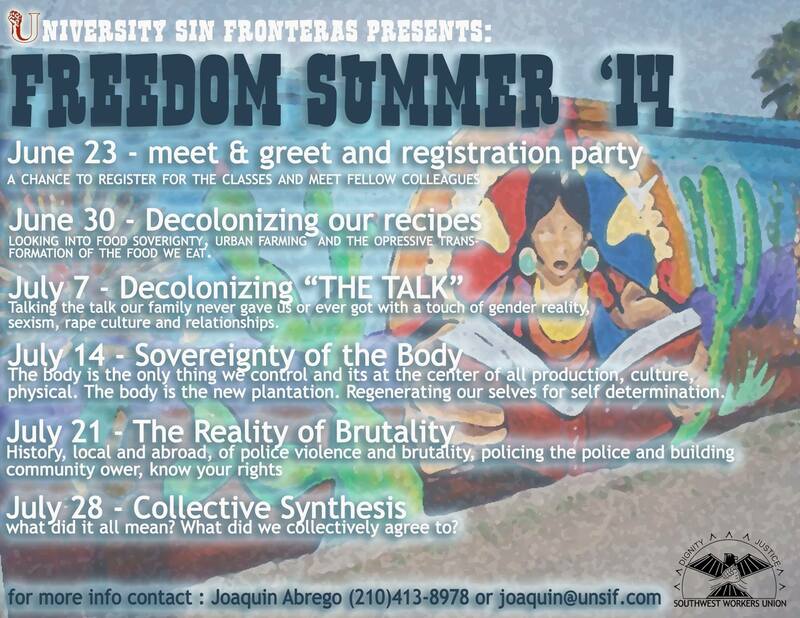 We invite you to the Freedom Summer 2014 semester of the University Sin Fronteras San Antonio Campus. June 23, 2014 you will get a chance to meet fellow colleagues and like minded individuals. This semester we will be challenging the negative power of the state and growing the power of the people through our knowledge, wisdom and over standing. Come get you some!!! we will also be doing individual / group projects for the summer as we use our knowledge and create actually tools for change. You can use this as a tool for future campaigns in your work or even just increase you self knowledge as we work towards freedom and self determination.